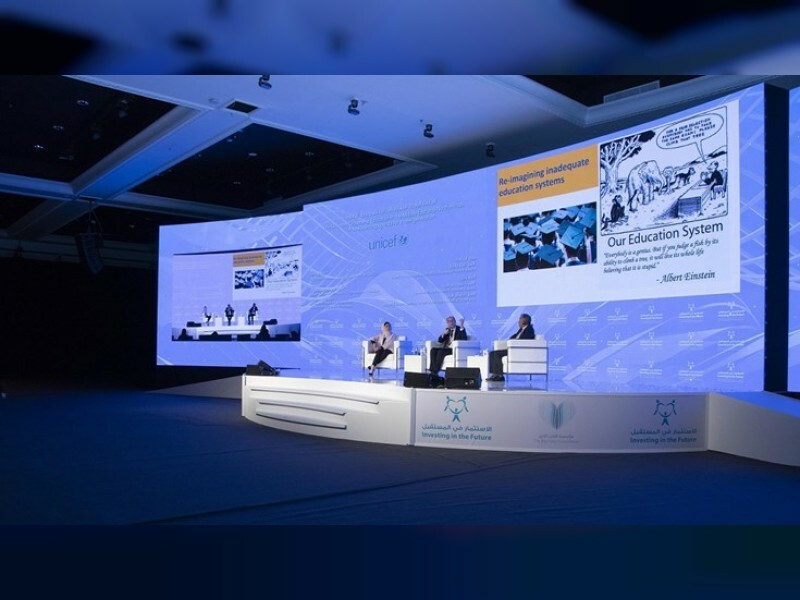 SHARJAH, 24th October, 2018 (WAM) -- The third 'Investing in the Future' (IIFMENA) conference ongoing in Sharjah, hosted a panel session Wednesday titled ‘Life Skills and Citizenship Education in the Middle East and North Africa’, in partnership with UNICEF to explore innovative pathways along with traditional learning system for the development of the youth. Rethinking the focus of learning and how it can be promoted to bring back 15 million non-school going children was one of the key agendas during the discussions. Most MENA countries stand at the bottom of standardised international assessment as compared to students of other region. They are unable to achieve the same level of learning outcomes. Data from employers reveal that graduates in this region do not have the skills needed for the labour market. As a result, the region has the largest youth unemployment and a third of the graduates from universities remain unemployed. This was according to Alberto Biancoli, Education Specialist at UNICEF, who said, "As a result of low-qualitylearning we have the highest rate of youth withouteducation or employment and have very low participation in citizenship". "Education is about personal empowerment in active citizenship," he added. The panel then reflected about a new learning agenda for empowering children and youth. All panelists reiterated the need for an open learning system, that’ll provide the youth with opportunities to master life and soft skills. So, thelatest challenge at hand is to develop new modes of teaching and learning. With a shift in promoting 21stcentury skills, schools, higher institutes and even the governments need to incorporate changing practices. Reforming the national curriculum to shift away from the traditional rote learning system to a new vision of educating is seen as a key step. But this has to be coupled with an enabling environment. Biancoli said, "We need to look at schools and communities and assess how they are interlinked. Life skills are becoming key elements for national reforms. Therefore, it is imperative to make this advocacy evidence based to see if such new methods are moving in the right direction". Shifting focus to integrate technology to develop life skills was also high on the agenda. Hadeel Naser Aldin, Project Officer at Al Nayzak Organization in Palestine, emphasised on developing creative thinking and team building skills to find solutions. Aldin noted: "These skills impact students later duringemployment life. They complement the market skills and help in shaping personalities". The discussion also focused on stimulating life skills during school age that would eventually benefit the job market. Lastly, a key challenge in this direction is to establish any kind of educational setup in conflict areas. Since, children outside the formal education system is not a homogenous group with many being in varied age groups and in different crisis situations, the need for civil organisations gets heightened. Oujour Hssain, Director of Non-Formal Education, Ministry of Education of Morocco, said, "How can you convince a truant to rejoin school? Therefore, alternative, vocational training becomes important. Also, an adequate curriculum needs to be developed that can be integrated along with vocational courses". Panelists emphasised that should prepare children to leap into the future – being ready to learn, ready to be employed, ready to actively engage and to take control over their own personal growth.